James Rhodes presents music has changed his life. Including recordings by Glenn Gould, Vladimir Horowitz, Marc-Andre Hamelin, Evgeny Kissin and Nikolai Demidenko. 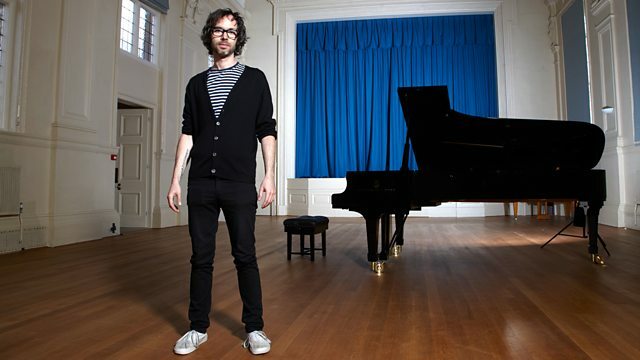 In the second of two programmes this month pianist James Rhodes presents music that's changed his life: including recordings by iconic twentieth century pianists Glenn Gould and Vladimir Ashkenazy, and performances by some of today's leading virtuosi including Marc-Andre Hamelin, Joseph Moog, and Evgeny Kissin. Plus extracts from The Marriage of Figaro conducted by Teodor Currentzis. Until the age of 14, James had no formal academic musical education or dedicated mentoring. Aged 18 he stopped playing the piano entirely for a decade. Since returning to the piano, he has released five albums, all of which have topped the iTunes classical charts. His bestselling memoir, Instrumental, is a moving and compelling story that was almost banned until the Supreme Court unanimously overthrew an injunction in May 2015. He has performed in venues around the world from the Barbican, Roundhouse, Royal Albert Hall, Latitude Festival, Queen Elizabeth Hall and Soho Theatre in the UK to halls in Paris, Australia, Hong Kong, Chicago, Vienna and more. Plus news of how you can take part in a special edition of Saturday Classics with James later this summer if you're an amateur pianist as part of the BBC Get Playing campaign. Performer: Alexandre Rabinovitch-Barakovsky. Orchestra: Orchestra di Padova e del Veneto. Conductor: Jörg Faerber. Performer: Vladimir Ashkenazy. Orchestra: London Philharmonic Orchestra. Conductor: Lorin Maazel. Performer: Maria Forsstrom. Performer: Nikolai Loskutkin. Singer: Simone Kermes. Singer: Fanie Antonelou. Singer: Andrei Bondarenko. Singer: Krystian Adam. Orchestra: MusicAeterna. Conductor: Teodor Currentzis. Singer: Christian Van Horn. Le Nozze Di Figaro: "Dove Sono"
Singer: Simone Kermes. Orchestra: MusicAeterna.